At First New York Federal Credit Union, kids and families get special attention. That's why the Albany-based institution sponsors KID$ (Keep Investing Dollars $avings), a regional school banking program symbolized by a piggy bank logo. So, when First New York entered a float in the Niska-Day Parade (in nearby Niskayuna), they furnished it with an adorable mascot inspired by the KID$ logo: a giant inflatable piggy bank named Super Saver Pig. Designed and built by Landmark Creations, Super Saver Pig made a huge hit at the Niska-Day parade. According to Lucas Fiedler, First New York's Membership Development Officer, "five months [later], we still have members coming into our branches referencing seeing the float." Why did Fiedler turn to Landmark to create Super Saver Pig? "I researched companies who produced custom inflatables," he says, "and found Landmark to have some of the highest customer satisfaction reviews." After speaking with Landmark, he was further impressed by the firm's "response time and attention to detail." In recent months, Super Saver Pig has appeared at a variety of regional events. 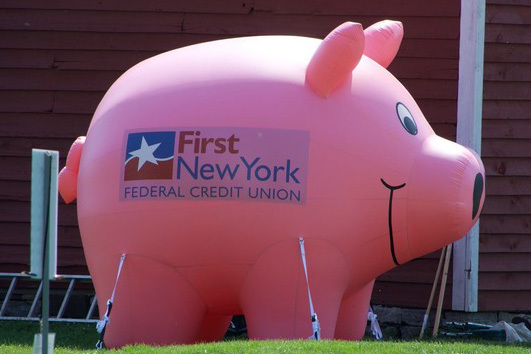 Says Fiedler, the giant inflatable piggy bank helps the credit union "project an image of a fun and inviting institution." What's more, the inflatable mascot has given Fiedler an endearing new title – as "Keeper of the Pig."